TuffSkin Surface Protection will exhibit at an interactive booth during the International Interior Design Association HD Expo (Booth 1858), running May 3-5, 2017 at Mandalay Bay in Las Vegas. 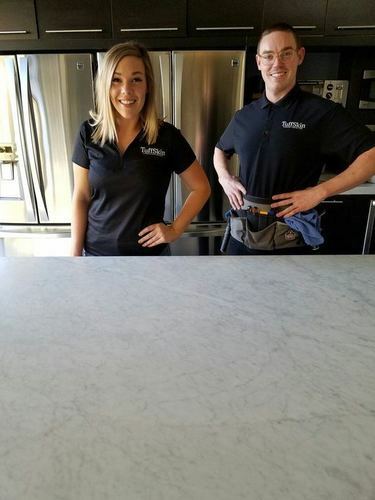 TuffSkin Surface Protection has created a system to protect stone countertops, tables, bars and vanities. Architect- and designer-recommended TuffSkin has been solving housekeeping and maintenance issues in hotel rooms and lobbies, restaurants and bars. Frank Friedlander, vice president and developer, invented the product in 2007 to solve a problem for a hotel's engineer. The company now serves hospitality, commercial and residential clients across the United States, Canada and beyond, including Australia and Mexico. Lelia Friedlander, president of TuffSkin, said, "The HD show is an important event for us because we have the opportunity to meet with designers, architects and other professionals within the hotel industry." Expo attendees will have the opportunity to test the benefits of TuffSkin personally to see how it works. The acid and stain-free formula increases durability and longevity of TuffSkin's proprietary stone laminate on marble, onyx or travertine by eliminating etching and staining caused by alcohol, coffee, water, wine, juice, oils, lemons, perfume, toothpaste and makeup. TuffSkin also tolerates heat over 800 degrees Fahrenheit. Because TuffSkin's laminate is liquid impermeable but gas permeable, it lets stone "breathe." It disappears on surfaces and brings out the stone's natural beauty. TuffSkin's original Gloss is perfect for polished stone while TuffSkin's newer Satin complements a honed stone surface. The company's Gloss product won the Surface/Coating Systems Award in the Applied Finishes and Materials category in the 2012 International Interior Design Association's Hospitality Design competition. TuffSkin expanded its residential division in 2016. Recent installations include MGM National Harbor in Baltimore, Maryland, and the US Grant in downtown San Diego along with a number of luxury residences in Australia and Las Vegas.